Linkshell RULES!!!!! NO DRAMA !!! NoLimit Linkshell RULES... Live by them or Get the Boot!! FROM NOW ON.. YOU ARE REQUIRED TO BE AT A LS EVENT WHEN YOU ARE INGAME, IF YOU ARE NOT GOING TO ATTEND THEN PLEASE LET ME KNOW!!! POINTS WILL BE UPDATED WITHIN 24HRS AFTER A LS EVENT!!! 2. EVEN IF WE HAVE A LS EVENT THAT YOU ARE NOT IN MAIN ALLIANCE PLEASE UNDERSTAND YOU WILL BE ROTATED IN TO BE ABLE TO GET EXPERIENCE KILLING THAT MOB. HOWEVER.. YOU DO GET POINTS FOR BEING AT THE EVENT.. NO MATTER WHAT.. BUT YOU HAVE TO STAY FROM BEGINNING TO END AND NOT AFK THE WHOLE TIME. SO.. THAT BEING SAID.. IF YOU COME FOR 1-2 HOURS BUT THE WHOLE LS IS THERE FOR 10HRS.. AND YOU LEAVE TO GO DO EXP PARTY, OR CAMPAIGN etc....Unless it has been discussed with me (Dreamsaver) FIRST!!!!!!! IF YOU LEAVE AND YOU ARE SEEN IN ANOTHER AREA OTHER THAN WITH THE LS DOING EVENTS, YOU WILL NOT GET ANY POINTS!!! 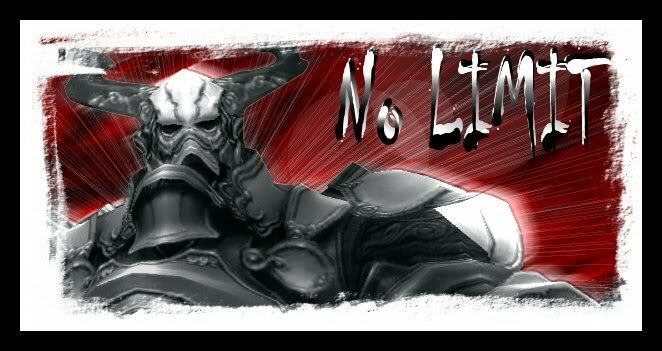 ~~~ON THIS NOTE I WILL NOW ADDRESS ANOTHER ISSUE ABOUT PPL WHO HAVE MORE THAN ONE CHAR AND WHO ATTEND EVENTS ON THOSE ALT CHAR'S WITH OTHER ENDGAME LINKSHELL'S........ YOU WILL BE ABLE TO LOT ON GEAR AS LONG AS YOU FARM WITH NOLIMIT.. AND YOU OR YOUR ALT CHAR SHOWES UP FOR NOLIMIT SCH'D EVENTS.. if you are with your other LS during NoLimit events and miss OUR event... YOUR LOTTING RIGHT'S HAVE CHANGED!!! I HAVE NOT MADE A RULE ABOUT THIS MATTER UNTIL NOW... I DO NOT CARE THAT YOU HAVE ALT CHAR'S BUT BECAUSE YOU DO NOT REMAIN "LOYAL" TO NOLIMIT YOUR LOTTING RIGHTS HAVE CHANGED, SINCE YOU ARE IN MORE THAN ONE ENDGAME LS... YOU WILL NOW BE AT THE BOTTOM OF THE LIST OF BEING ABLE TO LOT FOR GEAR THAT YOU WANT/NEED, YES I UNDERSTAND YOU STILL MAY COME TO FARMING EVENTS BUT BECAUSE YOU ARE IN MORE THAN ONE "SKY" LS.. YOU ARE ALSO ABLE TO HAVE A CHANCE OF GETTING THAT SAME GEAR WITH THEM.... UNTIL YOU ARE "LOYAL" TO NOLIMIT AND ITS EVENTS.. THIS RULE IS IN PLACE AND WILL REMAIN!! IF YOU DO HAVE ALT CHAR'S AND USE THEM FOR ONLY "NOLIMIT" THEN THIS DOES NOT APPLY TO YOU!!!! IT IS NOT FAIR TO SHOW UP ONLY TO GOD'S/KIRIN'S!! 3. IF YOU ATTEND AN EVENT BUT THEN SOMETHING IN REAL LIFE COMES UP, THEN YES.. YOU WILL GET POINTS FOR ATTENDING. 4. YOU CANNOT JUST SHOW UP FOR GODS OR KIRINS TO EARN POINTS AND THINK YOU WILL BE ABLE TO LOT ON GEAR... YOU HAVE TO COME TO FARMING.. IT IS NOT FAIR TO MAKE THE OTHER LS MEMBERS FARM FOR POP ITEMS FOR GEAR YOU WANT/NEED.. YOU HAVE TO DO THE WORK ALSO TO BE ABLE TO GET GEAR.. SO THE MORE YOU FARM THE MORE POINTS YOU GET... AND YOU WILL GET GEAR.. IN THE END.. ALL THINGS SAID AND DONE... LS LEADER'S HAVE THE ULTIMATE SAY IN WHO CAN LOT!! 5. Do not make me angry - I sound like James Earl Jones aka Darth Vader!!! - I am your FATHER! WHEN I SAY DISCUSS WITH A LS LEADER, I MEAN CONTACT ME : DREAMSAVER.. IF I AM NOT ON THEN YOU ARE TO CONTACT, JUNNO, ANABELLA, KILIOS... POST ON FORUMS OR SEND ME A MSG ON THE WEB-SITE... Do not send me a / tell in game.. send me a MSG in-game..if you have to add me to friends list.. THEN ADD ME!! 6. Only lot on the item your job level can use/equip at that Time.!!! 7. Participation in farming events will affect your lotting privileges YOU MUST FARM. 8. No using your points to lot for someone else. Your points are your points alone. 9. Leaders will have the ultimate say if things get too out of hand. If you feel there is a problem or concern please feel free to discuss with me or other leaders. 11. Please come to events on the Job you are asked to show as.. This is not a ME, MYSELF or I , LS, we are all here to get gear but we need the ppl on the right jobs. IF you need a Buffer on a job.. Sky is not the place to get it.. You have Free time please get your job's a buffer during Free Time! 12. NO DRAMA!!!! NO DRAMA!!!! NO DRAMA!!!!!! !